The Yankees have traded for Giancarlo Stanton. The Yankees will lose Starlin Castro and prospects Jorge Guzman and Jose Devers. The Marlins will send the Yankees some cash, likely about $35 million. The 1927 Yankees are the go-to lazy heuristic for commentators who want to say that a team’s lineup is really good. It’s easy to forget how good Murderer’s Row was: Earle Combs, Lou Gehrig, Babe Ruth, Bob Meusel, and Tony Lazzeri at the height of their powers. With Giancarlo Stanton, the 2018 Yankees can earn the same comparison. Stanton and Aaron Judge will join Gary Sanchez, a legitimate 40-home run threat on his own, to form the best lineup in baseball. The Yankees led baseball with 241 home runs last season. 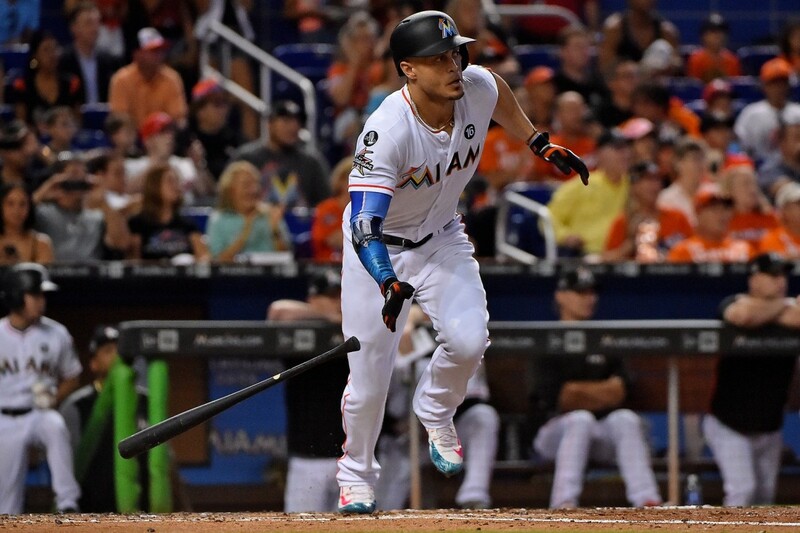 With Stanton, they will have a good shot at breaking the all-time single-season team home run record of 264, set by the Seattle Mariners in 1997. They might do it with some room to spare. Stanton carries a relatively modest $25 million luxury tax hit and about $22.3 million after the Marlins cash. Starlin Castro’s cap hit was $8.6 million. The Yankees still have strong incentives to keep their payroll under $197 million for the 2018 season. Based on my estimation earlier this season, this trade puts the Yankees at around $184 million, with a starting pitching slot left to fill. CC Sabathia will come cheap, but I doubt he’ll come < $10 million cheap, and even so the Yankees aren’t leaving themselves much margin for error or deadline trades. My guess is that Jacoby Ellsbury is still going somewhere as a straight salary dump. Ellsbury is now completely useless on a team with three corner outfielders and Aaron Hicks. If they can save $5 million on the final years of his contract, they can put that money toward signing CC Sabathia. Dellin Betances ($4.4 million estimated) and Adam Warren ($3 million) are almost certainly gone as well. Had Gleyber Torres not gone down with a freak injury, there is little doubt in my mind that he would be on the starting Yankee roster. He’s really good: Torres is the #1 prospect in the Yankee system, top-5 in baseball. He was in the middle of a huge breakout season at 20 years old in the high minors, following an AzFL MVP win at 19. That said, it feels early to bet on Torres. I thought the Yankees would send him back to Triple-A for at least a month to delay his service time and give him some time to get rolling after the injury. Now, the Yankees have little choice but to play him. If he struggles in spring training, they’ll have to choose between Ronald Torreyes and Tyler Wade at the position. That’s not great. 4. The Yankees upgraded their worst position. Yankees designated hitters were almost exactly replacement level last year. While the Yankees will almost certainly rotate Stanton, Judge, Gardner, and Sanchez at the position, for all intents and purposes Giancarlo Stanton is replacing those at-bats. The Yankees received two runs above average at DH last season. Stanton was worth +48 runs last season or an improvement of approximately 5 wins. The Yankees are probably now favorites to win the AL East. Aaron Judge and Giancarlo Stanton will be the starting left and right fielders for the Yankees for the foreseeable future. Brett Gardner is around for the next two years barring a trade. Aaron Hicks is in center. Even with the potential to stash someone at DH, it’s hard to see a long-term role for Clint Frazier. In fact, it’s hard to see Clint Frazier getting much playing time next season barring one or two injuries. It will be interesting to see how the Yankees handle Frazier. I wouldn’t be shocked to see a trade. The Yankees looked poised to sign Bryce Harper next season to a massive contract. That’s not happening anymore. I get that Judge and Harper can fake it in center field, but it’s not realistic to expect Harper to play there into his late 20s. He’s not going to be a Yankee. Manny Machado is a much more likely big-time signing. Bronx Beat Episode 121: Giancarlo! Will they have the money to sign Machado? Won’t that pretty much guarantee that they’re above the luxury tax cap for the foreseeable future?